Pick at least three shows from our upcoming season to build your own package and get Woolly exactly the way you want. Three-show subscriptions start at only $120! Which plays would you like to include? In 1920, Russian Jewish writer Isaac Babel starts a diary while wandering the countryside with the Red Cavalry. In 2010, after the crash of an aircraft carrying the Polish president, his diary is discovered among the wreckage. What did Babel write, and why does it matter so much to a low-level KGB agent who may or may not be Vladimir Putin? Describe the Night uncovers the mystery by tracing the stories of seven lost souls connected across decades by history, fiction, lies, and blood. 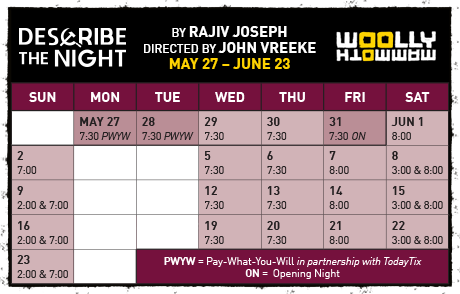 Pulitzer Prize-finalist Rajiv Joseph returns to Woolly after hit productions of Guards at the Taj (2016) and Gruesome Playground Injuries (2010). Describe the Night is a “work of major ambition” (New York Times) that will feel both timeless and tuned in to the age of #FakeNews. Betsy LaQuanda Ross is a self-proclaimed “Peculiar Patriot,” who makes regular visits to penitentiaries in order to boost the morale of her loved ones. When she is not sharing neighborhood updates and gossip, Betsy illuminates our country’s cruel and unjust criminal justice system and its impact not only on the 2.3 million people behind bars, but also their family and friends. 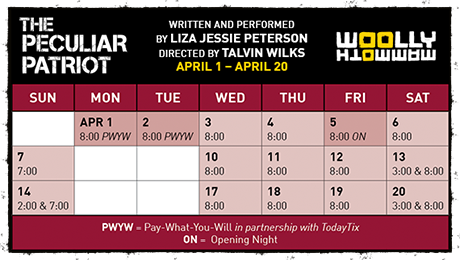 Written and performed by the inimitable Liza Jessie Peterson and inspired by her decades-long work with prison populations including on the notorious Riker’s Island, The Peculiar Patriot is a fierce, funny, and shrewd indictment of the systemic inequity within America’s fastest growing industry, tracing its roots from the plantation to the prison yard. Please note that The Peculiar Patriot does not have an intermission and concessions will only be open before the show.